I’ve carefully been watching the crowds in my keynote presentations over the years, and have come to realize that there is a direct relationship between the nature of the audience, and the way that they react to my observations on the future. Call it Carroll’s law, because what I’ve learned is this — those doomed to extinction and other severe career implications as a result of rapid change, are usually the least receptive to a message as to the reality of their impending doom. They would prefer to escape rather than adapt to reality. 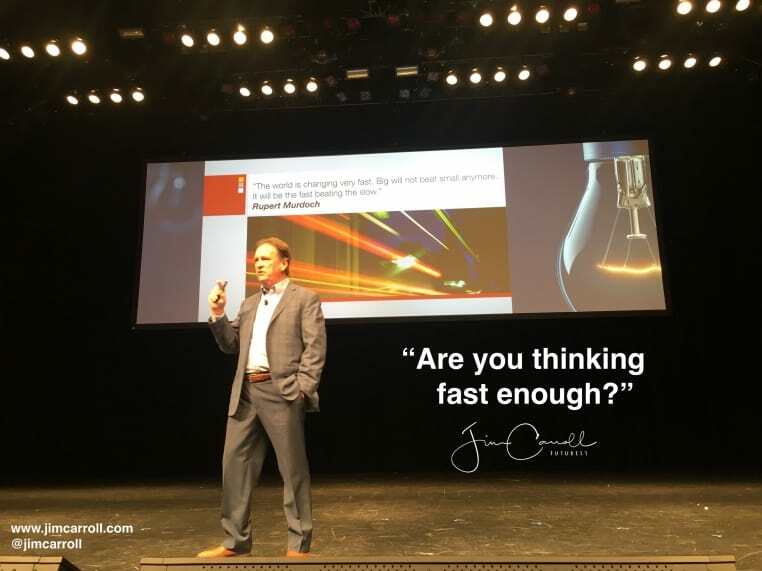 Looking out into the audience, it sometimes seems like I’ve got a bunch of deer in the headlights — they seem so shocked by the change that is occurring around them that they don’t know how to take the next steps of figuring out what to do about it. This is particularly true when I discuss the reality of outsourcing/offshoring, or when I focus in on how rapid innovation, fuelled by scientific advance, will continue to cause havoc and turmoil in every industry. I wrote about this situation earlier here. And a year ago, my Profit magazine column noted that there were some big board/insurance issues emerging. What’s the future for intelligence? We live in a time of massive challenge, and yet one of massive opportunity. We’re faced with deep and complex issues involving the environment, health care, water and food. At the same time, every industry is faced with upheaval and disruption. In this context, every industry is being redefined at blinding speed by technology, globalization, the rapid emergence of new competitors, new forms of collaborative global R&D, and countless other challenges! The speed with which these changes occur are now being increasingly driven by the arrival of a younger, more entrepreneurial generation; a group that seems determined to change the world to reflect their ideas and concept of opportunity. They’ve grown up networked, wired, and are collaborative in ways that no previous generation seems to be.